Torn knee cartilage, otherwise known as a meniscus tear, is one of the most common conditions and injuries that involve the knee. It can be caused by injury from sporting activities, work activities, obesity, heredity, and merely by the aging process. The most common cause of injury is the twisting mechanism. This can happen from falling, slipping on wet/icy surfaces, mis-stepping on stairs, running or jumping. Cartilage tears can also occur in conjunction with a knee sprain. Most people complain of a noticeable "pop" in the knee at the time of injury, with pain and swelling following close behind. There are two kinds of cartilage inside the knee joint; hyaline cartilage; a soft plush substance which actually covers the joint surfaces, and the meniscus, which is a much harder, gristle-like substance that serves as shock absorbers and stabilizers of the knee. In the vast majority of cases, when a reference is made to “torn knee cartilage” in the knee, it is most likely the meniscus that is being referred to. 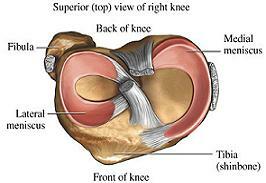 There are two meniscal structures within the knee, one lateral and one medial. They are C- shaped and have a wedge-like thickness to them. Tears of the meniscus can occur in many different forms and patterns, and in many cases, the pattern can dictate the kind of treatment that may be required. Some tears can be repaired; some can be simply trimmed, while others must be completely removed. The age of the patient also can determine the treatment course. Certain tears can be repaired in the younger, more active or athletic person, while that same tear would more than likely be simply removed in the older more sedentary person. In the case of chronic degenerative arthritis, one or both menisci can be involved, and the tears are usually a result of the meniscal tissue becoming brittle and degenerated over time. These degenerative conditions can lead to fraying and flagrant tearing of the meniscus, as well as scraping and damage to the joint surface from these torn fragments. Symptoms that usually present themselves with these situations frequently include swelling, pain along the joint line, “catching” or “popping”, buckling (giving way) with certain movements and even locking of the knee. When the knee becomes “locked”, it is usually because the meniscus has displaced itself inside the knee, and becomes ”stuck” between the femur and the tibia, preventing the knee from either fully straightening or fully bending. Treatment can range from conservative management with medication and physical therapy in mild cases, to surgical intervention. The most common type of surgery for these problems is knee arthroscopy.